Payday loans get negative publicity from the web and print media. Payday loans get negative publicity from the web and print media. Renowned financial experts are advising people to stay thousands miles away from the predatory payday loan lenders. Several state governments have already banned payday loan practices. Others have brought strict payday loan laws which most of the lenders have not intention to adhere to. Still, the number of storefront payday loan lenders is staggering in the country. The payday loan industry is ruling the country in spite of the best efforts of the country. What is the secret behind the success of the payday loan lenders? Payday loans offer quick cash to the consumer without much hassle. This is the main reason why payday loans are so popular in the country. Unlike the credit cards and other loans, consumers can receive payday loans within a couple of hours. Lenders don't even bother to check the credit score of the consumers. This makes the task easier for the cash-strapped consumers. They need money and the payday loan lenders are providing it. 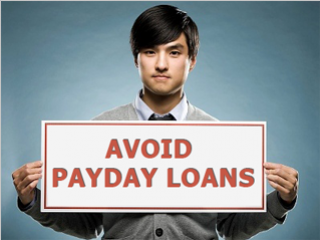 Why is it important to avoid payday loans? Generally, you can handover a personal check to the lender for the money he is giving you. The lender will cash-in the check on the date (your next payday or any other agreed day) written in the check. 1. Payday loans come with exorbitant interest rates: The maximum interest rates charged on the credit cards vary between 28-36%. Many consumers find it difficult to pay such high interest rates to the credit card companies. Just imagine the plight of the consumers who have to pay nearly 300-400% interest rate on the payday loans. Payday loan lenders charge very high interest rates. They know their customers are those people who can't qualify for normal loans. They take advantage of this fact with full force. 2. It is very easy to get into debt: It is extremely easy to get into the vicious cycle of the payday loan trap. As it has already been mentioned, the interest rates on the payday loans are very high. Most people are unable to come up with money to clear these debts. As such they are more or less compelled to roll over these loans. They either make arrangements to extend the due date or take out another new loan to repay the existing loan. So, even though maximum people borrow payday loans for 1-2 weeks, then end up getting trapped for around 6-7 months. 3. It is very hard to get out of debt: It is very easy to get into debt, but it is equally difficult to get out of it. You may not get rid of the debt even after paying the double or triple amount. The loan amount will keep on increasing days after day. The compounding interests will create a giant hole in your pocket. 4. Lenders will drain your account: Some of the payday loan lenders will give you a special benefit. They'll tell you that there is no need to send a check to them. They will withdraw the money directly from your checking account. You happily give them your banking details and sleep easy. The real problem begins when the loan amount become so high that you're struggling to meet your living expenses. You have hardly any amount in your checking account, but the lenders will not hesitate to withdraw it. Your life will become hell from the day you realize that loan amount is beyond your affordability. Payday loan lenders are accustomed in dealing with defaulters. Nearly, 10-20% of the borrowers default on the loans. These borrowers face aggressive collection tactics. The legal payday loan lenders will debit money from your account till the loan is completely paid off. If you don't have any more money in the account, then they'll file a lawsuit against you in the court.